In the world of sports, legendary broadcasters become like family to their team’s fan base. For whatever reason, the connection baseball broadcasters have to their team’s fans is different than in other sports. The Chicago Cubs had Harry Caray, the St. Louis Cardinals had Jack Buck, the Los Angeles Dodgers have Vin Scully, the Detroit Tigers had Ernie Harwell, and so on. I could go on and on and name many more, but you get the idea. In Philadelphia, there is one name that was synonymous with Phillies baseball; one name that, when someone said the word “Phillies”, it was the first thing that came to your head. 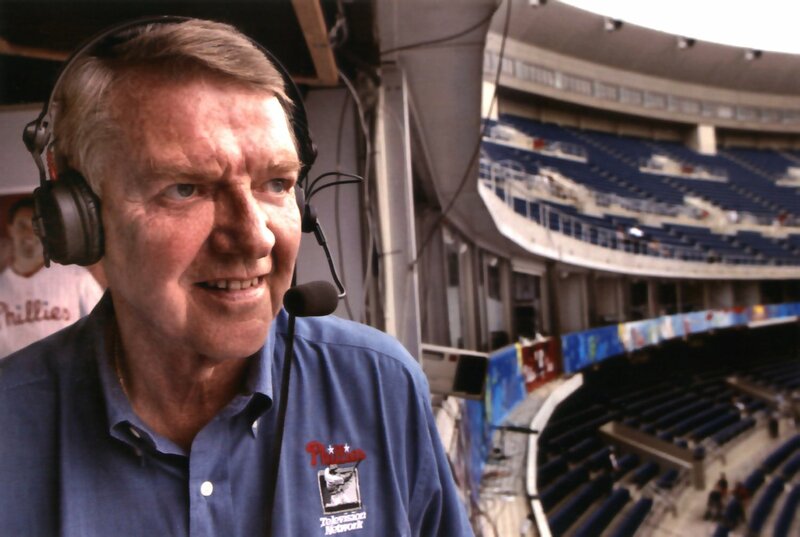 In 1970, Phillies broadcaster Bill Campbell, who, along side By Saam, called Phillies games since 1963, left and was later replaced by Houston Astros broadcaster Harry Kalas. He was not welcomed warmly due to the popularity of Bill Campbell, but it did not take him long to win over fans with his smooth baritone voice and passionate love of the game of baseball. Though many fans were accustomed to By Saam and Bill Campbell, it didn’t take long for Harry to win over the Phillies fanbase. Kalas remained the tv play-by-play voice for the Phillies for the next 38 years until the afternoon of April 13, 2009, 5 years ago today. 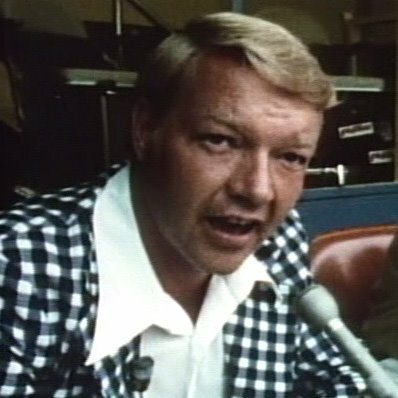 Kalas was preparing to call a game between the Phillies and the Washington Nationals at Nationals Park in Washington D.C when he collapsed in the broadcast booth and died shortly after. In a matter of just under two hours, the voice of Phillies baseball for nearly four decades, and, for some fans, generations, went silent. Kalas was 73 years old. Kalas’ sudden death was met with an unbelievable amount of shock and sadness. “We lost our voice today.” Phillies owner David Montgomery said, soft-spoken and visibly shaken, shortly after news broke of Kalas’ death. Former Phillies pitcher and current radio color commentator Larry Andersen tearfully spoke about Harry leading the 1993 team in “High Hopes”, the song he would often sing in celebration after a big Phillies win. As a tribute to Kalas, Tom McCarthy and the rest of the Phillies TV broadcasting team remained silent during the first inning of the Phillies – Nationals game in Washington DC which took place the day he died. There was a brief uncertainty as to whether or not the game would be postponed. However, the Phillies all agreed that Harry would have wanted the game to go on as scheduled. So, after a moment of silence was observed before the game, that’s exactly what happened. 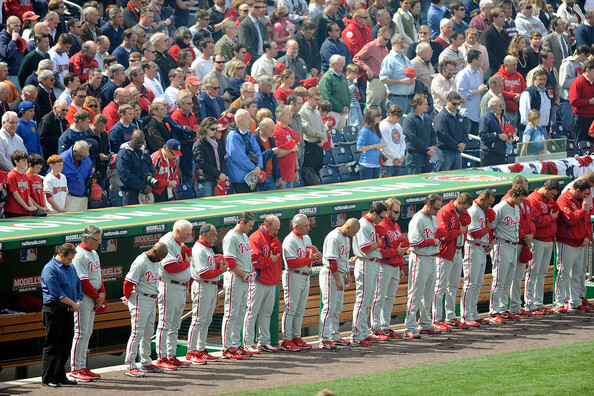 A heavy-hearted Phillies team played as scheduled on the day Kalas died. The Phillies went on to win 9-8. A memorial service was held at Citizens Bank Park and his casket was placed behind home plate, an honor that only Babe Ruth and longtime St. Louis Cardinals broadcaster Jack Buck had received prior to this. Thousands of fans showed up, many in tears by the end of the ceremony. Every Phillies fan has their memories of Harry and their favorite calls of his. One memory in particular sticks out to me when it comes to Harry Kalas and it happened back when I was around 12 years old. My dad, a dentist, had gone down to Clearwater, Florida that spring during Spring Training to examine some of the players and coaches regarding chewing tobacco and oral cancer. Later that season, a group he worked with was presenting a check along with a couple of players before the game and my dad was one of the people who was on the field at Veterans Stadium (“The Vet”, as fans called it) presenting the check. My mom and brothers were also there and we had press box seats for the game. During the game, I had to go to the bathroom so my dad and I went to the bathroom and as I was finishing up, an older man walked up next to me to use the bathroom. He turned and said “How are you doing son?”. When he walked in, I recognized him, but I wasn’t entirely sure it was him until he turned and said hello in that familiar baritone voice. It lasted all of about three minutes, but I will never forget it. He had such a tremendous impact on Phillies fans and players, past and present, that when he passed away, it almost felt like you had lost a member of your family. His legacy lives on through his three sons, as well as at Citizens Bank Park, where the TV broadcast booth is named in his honor. Many fans and current and former Phillies alike remember Kalas for his love of baseball, his legendary baritone voice that was the sound of many summers, his singing of “High Hopes” and his long list of memorable quotes and calls from some of the Phillies’ most memorable moments. His most famous call actually started with Phillies shortstop (and later manager and coach) Larry Bowa and batting practice. Kalas, who was in his early stages as Phillies broadcaster and still in search of a famous “catch phrase” for home runs, was standing behind the batting cage as Greg “The Bull” Luzinski took batting practice. Luzinski, who was known for his mammoth home runs, crushed a ball into the upper deck of The Vet. Larry Bowa reacted in amazement and said “Wow! That’s way outta here.” Kalas thought that “it had a nice ring to it”. Just like that, Harry had a catch phrase and continued to use it up until his death. Having heard Harry say in excitement “That ball is OUTTA HERE!” many, many times, I have to say, and I think I speak for every Phillies fan, it does have a nice ring to it. Perhaps his best call came in October of 2008 in Game 5 of the World Series. In 1980, the Phillies defeated the Kansas City Royals 4 games to 2 to win their first ever World Series Championship. However, due to broadcasting rules at the time, local announcers were not allowed to call the game. So, despite the Championship, Kalas did not get to call the final out. 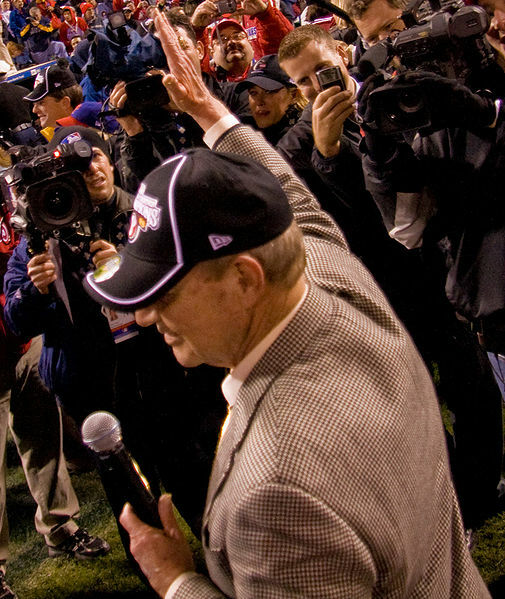 Not only did Harry Kalas get to finally call a World Series Championship for his Phillies, but he was right in the middle of the celebration, singing “High Hopes” after the game. Of course, where else would he be for a moment like this? Those are just two memorable Harry Kalas moments. If you were to ask 100 fans about Harry Kalas, many would have similar favorite moments, but all of those fans will have their own individual memories and memorable moments of Harry. They all paid tribute in their own way. It just goes to show you: Harry Kalas may be gone, but he has never, and will never, be forgotten. 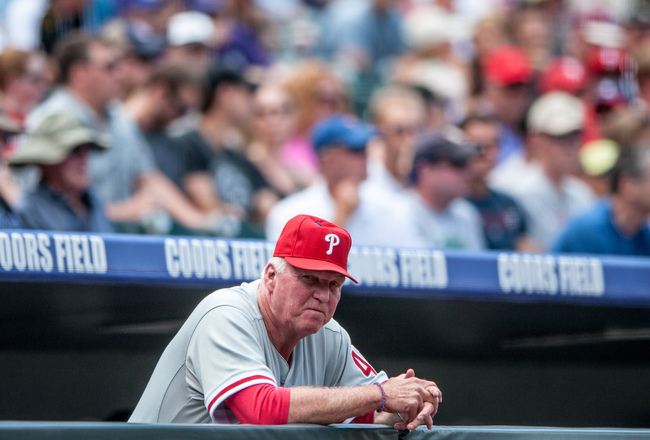 The Phillies fired manager Charlie Manuel today after nearly 8 seasons. This season has been a total mess for the Phillies. Today, with the team well on its way to their first losing season since 2000, the Phillies fired manager Charlie Manuel and named third base coach Ryne Sandberg interim manager. This was the last year of Charlie Manuel’s contract and many fans (myself included) were certain that this would be his final year as manager. However, the timing of the move is a little surprising. Many people were hoping that the Phillies would at least wait until the end of the season and let Charlie retire. Instead, General Manager Ruben Amaro Jr. decided to make the change now and evaluate Ryne Sandberg as a big league manager. Manuel, who was hired in 2005, faced some criticism early on but soon silenced the critics when the Phillies began to show signs of improvement. Manuel led the Phillies to the National League East Championship in 2007, their first since 1993, after the New York Mets finished of an epic collapse on the last day of the season. It was after this season that Charlie really started to win over the city of Philadelphia, which is no easy task by any means. The next year the Phillies repeated as NL East Champions en route to capturing just the second World Series title in franchise history, and their first since 1980. Charlie’s 2008 club played some of the best baseball under Manuel that year. By this point, the Phils had become the talk of Philadelphia and Charlie Manuel was simply known as “Charlie” amongst fans. Under Manuel, the Phils went on to win the NL East in 2009, 2010 and 2011. Only two other managers in recent years can lay claim to this feat: Bobby Cox (with the Atlanta Braves) and Joe Torre (with the New York Yankees), not bad company for Manuel to be with. As remarkable a feat as 5 straight division titles is, and it certainly is no small feat, the Phillies postseason performance started to decline after the 2008 season. The 2009 Phillies came within two outs of repeating as World Series Champions, falling to the New York Yankees in 6 games. The next year, despite boosting their rotation with the addition of Roy Halladay, the Phils fell to the San Francisco Giants (who went on to win the World Series) in 6 games. The 2011 club won a remarkable 102 games in the regular season, only to fall in 5 games to the St. Louis Cardinals (who went on to win the World Series that year). 2012 saw the Philles miss the postseason for the first time since 2006. It was at this point that some fans began to wonder if the clock was ticking on Charlie. After all, the Phillies has been stellar in the regular season but saw their season end a round earlier each year: 2009 – lost World Series, 2010 – lost NLCS – 2011 – lost NLDS, 2012 – missed playoffs. After a struggling 2013 season, general manager finally made the decision today to replace Manuel with third base coach Ryne Sandberg. However, it would be grossly unfair to place all of the blame on Charlie Manuel. After all, the core of the Phillies lineup was starting to show their age. Jimmy Rollins (34 years old), Chase Utley (34 years old) and Ryan Howard (33 years old) are all entering the later stages of their careers. Not to mention injuries in the starting rotation and a bullpen about as bad as any Phillies bullpen has ever been didn’t help the Phils either. Now that a change has been made at manager, it is time for general manager Ruben Amaro Jr. to man up and take responsibility for his mistakes. As the core of the lineup began to show his age, Amaro failed to get younger up and coming stars to mold and make stars in the big leagues. Recently Cody Asche, Domonic Brown, Kevin Frandsen and Darin Ruf have had a more prominent role in the lineup, however they should have been utilized sooner. Charlie Manuel will remain with the Phillies organization as an advisor to Ruben Amaro Jr. To Manuel’s credit, he exited in just about the classiest way he could. No complaints, no throwing anyone under the bus and no nonsense. He did have some kind words to say to the fans: “Keep coming to the yard. Love baseball. Support the Phillies”. And support the Phillies I will. Thank you Charlie. You will go down as the greatest manager in the 130 year history of the Philadelphia Phillies. The Phillies will take on the San Francisco Giants in the National League Championship Series beginning Saturday Night at 7:30 in Philadelphia. The expected pitching match up is one that is of main event proportions. In the red corner, pitching for the Phillies is expected to be Roy Halladay. Phillies manager Charlie Manuel has not officially set his starting rotation, but it is expected that Halladay will get the start in Game 1. In his playoff debut in Game 1 of the NLDS against the Cincinnati Reds, Halladay threw a no-hitter, only the second ever in MLB Postseason history. If Halladay pitches in Game 1, it will be 10 days after his historic outing against the Reds. Again, nothing has been made official, but it would be pretty surprising if Charlie Manuel decides to start someone other than Halladay in the series opener. In the orange corner, pitching for the Giants is expected to be Tim Lincecum. While the Giants have not yet made it official yet either, Tim Lincecum is expected to start against Halladay. Lincecum, who has won the last two National League Cy Young Awards, also had an incredible outing in his playoff debut against the Atlanta Braves, striking out 14 en route to a 2 hit shutout. In Lincecum’s only start this season against the Phillies. on April 11, he had 11 strikeouts, though wound up with a no decision. It’s not official, but it would be hard to imagine anyone else taking the mound for either team in Game 1. Both teams have solid rotations headed by a “big 3” (Lincecum, Jonathan Sanchez and Matt Cain for the Giants, Halladay, Roy Oswalt, and Cole Hamels for the Phillies). The last time these two pitched against each other was in the 2009 All-Star Game in St. Louis, and both pitchers wound up with a no decision. At any rate, this will be a heck of a start to what is shaping up to be a heck of a series. The Phillies moved to within 2 1/2 games behind the, first place, Atlanta Braves in the National League East. This game came at a price however. In the first inning, Ryan Howard rolled his ankle whle trying to get back to second after Ben Francisco singled to center. It is a “really bad sprain” as Howard himself put it. While Howard will miss some time, it is not known whether or not he will be making a trip to the disabled list. This is something that only he, Raul Ibañez and Jayson Werth have avoided this season. X-Rays taken during the game were negative, which was a good sign for Phillies Manager, Charlie Manuel. He did say that there is a chance Howard would be in tomorrow night’s line up. Cody Ransom came into the game in Howard’s place. Ransom stayed until the 7th inning when Ross Gload replaced him as a pinch hitter. We will see who will be starting at first base tomorrow night when the Phillies take on the Florida Marlins in Miami.